A writ petition has been filed in the Supreme Court challenging the Central Government's policy to refuse foreign aid for Kerala flood relief. The petition under Article 32 of the Constitution of India has been filed by Binoy Viswam, Rajya Sabha MP and leader of Communist Party of India (CPI). The petition seeks to direct Centre to allow Kerala to accept the foreign aid offered to it by various foreign countries like United Arab Emirates (UAE), Qatar, Maldives, Thailand and the United Nations towards the state flood relief fund. The petition asserts that acceptance of foreign aid is supported by law as per the Section 35(g) of the Disaster Management Act, 2005, clause 3.3.3 of the National Policy on Disaster Management, 2009 and Clauses 9.2 and 9.3 of the National Disaster Management Plan, 2016. It is stated that Kerala received unprecedented rainfall amounting to almost 2344 mm during the monsoon season resulting in the worst flood in nearly a century that left at least 231 people dead and forced thousands of people out of their homes. The Union Government has declared the flood in Kerala as a calamity of 'severe nature'. The losses are estimated to be almost Rs. 21,000 Crores by the state government. The Government of Kerala had requested the Union Government to immediately release an amount of Rs. 1200 crores as immediate relief to the state. The petition laments that the Union Government released only Rs. 100 crores, which is less than 1/10th of the amount requested by the state government. It is further stated that following public protests, an additional amount of Rs.500 crores was released by the Centre. However, even this amount is stated to be inadequate by the state government. The petition filed through Advocates Sriram P and Sarath Janardanan states that many Arab countries came forward to offer aid to Kerala as "Kerala shares a special bonding with the Arab world for the past many years due to its large expatriate community". It is mentioned in the petition that the government of UAE decided to donate an amount of Rs. 700 Crores towards Kerala flood relief fund, followed by Qatar with Rs. 35 Crores. Maldives has agreed to donate Rs. 0.35 crores and some other countries like Thailand have offered help to the disaster hit state. Even the United Nations has offered help to the state which is suffering due to financial crunch. However, the union government is stated to have denied the foreign aid stating an unwritten policy which is said to have been followed since 2004, whereby the country does not accept foreign aid towards disaster funds unless it is necessary. This policy is challenged in the petition as "arbitrary and violative of Articles 14 and 21 of the Constitution of India". It is contended that the refusal of foreign aid even before the estimation of losses and without making consultation with the state government is unreasonable and inconsistent with law. "Even if this policy is accepted in its letter and spirit, it is submitted that outright rejection as in the instant case without either assessing the losses or at least by making consultation with the state government to take into consideration the financial impact is arbitrary and is not even in consonance with the policy. This petition in no way challenges any policy decision. The petition instead challenges the arbitrariness in implementation of the policy without taking the steps provided for under the Disaster Management Act, 2005, National Policy on Disaster Management, 2009 and the National Disaster Management Plan, 2016." It is stated in the petition that Kerala does not have resources of its own to tide over the crisis and hence foreign aid is necessary. Therefore, it is contended that refusal of foreign aid will violate the right to life of people of Kerala guaranteed under Article 21 of the Constitution of India. 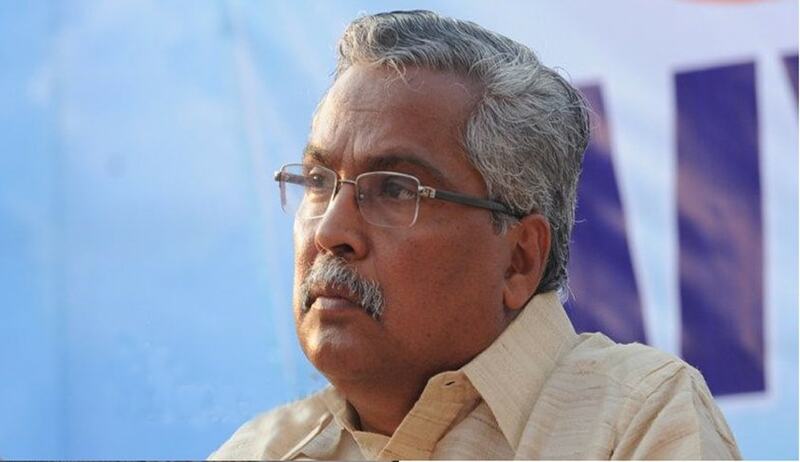 The petitioner Binoy Viswam was the Minister for Forest and Housing in Kerala Government during 2006-11. He was the petitioner in the case Binoy Viswam v. Union of India where the SC upheld the validity of Section 139AA of Income Tax, which mandated linking of PAN and Aadhaar number.